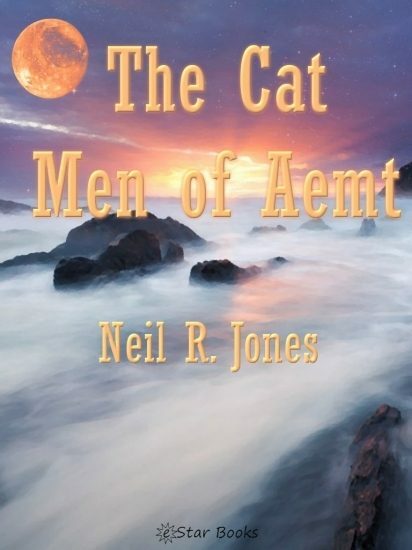 Professor Jameson and the other metal Titans of his band of Zoromes return to free the industrious race of Moeps from the oppression of the tyrannous Aemts. "We have seen no intelligent on this world yet," the professor remarked, "but still there seems to be a manifestation of mind force, thoughts close to us which are partly veiled." "It grows stronger up here," said 6W-438. 29G-75 bent over the edge of the pro¬jecting rampart and looked into the valley-far below. The space ship was many miles down the valley and lost to sight. 119M-5 was first to reach the plateau to which they were climbing and loosed a mental exclamation. "What is it?" asked the professor, scrambling up beside him and staring at a metal spheroid which glinted hack the rays of the sun. "Spaceship or aircraft of some kind." All four were now on the plateau, surprised to find this striking example of civilization on what they had come to consider an uncivilized world. "Dare we go any closer?" 29G-75 suggested. "If any intelligent creatures inside had sinister aims against us, they would probably have executed them already while we stood watching." Professor Jameson suited this thought with a slow, deliberate approach. As the machine men came nearer, they saw that two metal doors were swung open, as if whoever had left the ship had not returned. A sense of emptiness and loneliness pervaded the exterior of the craft. The four Zoromes stood and peered in through the doorways. Strange mechanisms and strange objects met their inquis¬itive sight, but they saw nothing living. "I shall go inside," the professor de¬cided. "Stay out here until we are sure everything is all right."